4Videosoft MXF Converter can convert MXF video to 3D movies and 2D videos including MP4, MOV, M4V, WMV, AVI and FLV and so on. Thus, you can easily enjoy them on your portable devices like iPhone 5S/ 5C, iPad, iPod, Samsung Galaxy S4, etc. 4Videosoft MXF Converter is the wonderful Video Converter to convert MXF video. It is able to convert MXF videos to 3D movies and other popular video formats like MP4, FLV, MOV, M4V, AVI, FLV and more with the best conversion quality. Besides, it provides you with splendid 3D editing functions and ordinary editing functions to optimize the output video freely. 4Videosoft MXF Converter can convert MXF videos to 3D movies and popular video formats like MP4, MOV, M4V, WMV, AVI and FLV and so on. It is very easy to operate and you can finish your conversion with the best quality and speed. This program highly supports the popular devices, so you are able to enjoy the output videos on your portable devices. You can enjoy your video on iPhone 5S, iPhone 5C, iPhone 5, iPad air, iPod nano, Samsung Galaxy Note3, Samsung Galaxy S4, HTC one and Sony Xperia and so on. This MXF Converter provides you with splendid editing functions to optimize your videos as you like. With them, you can enjoy a better 3D movie. Besides, it gives you professional 2D editing functions so that you can edit the video effect by adjusting brightness, contrast, saturation, hue and volume. And you can reset the video length and video screen size. You are enabled to add your favorite text and image watermark. It lets you merge several videos into one so that you can watch your movies fluently. You are enabled to preview the source videos and take snapshot easily. And these pictures will be saved in default folder. It enables you to convert your videos to popular audio formats you like. Torrent AVCHD Converter, convert avchd video to AVI, FLV, MPEG, VCD, DVD, 3GP, iPod Mp4, PSP MP4, MP4 format and to your iPod, iPhone, iTouch, PSP, PS3 and other digital devices. Supports batch conversion. 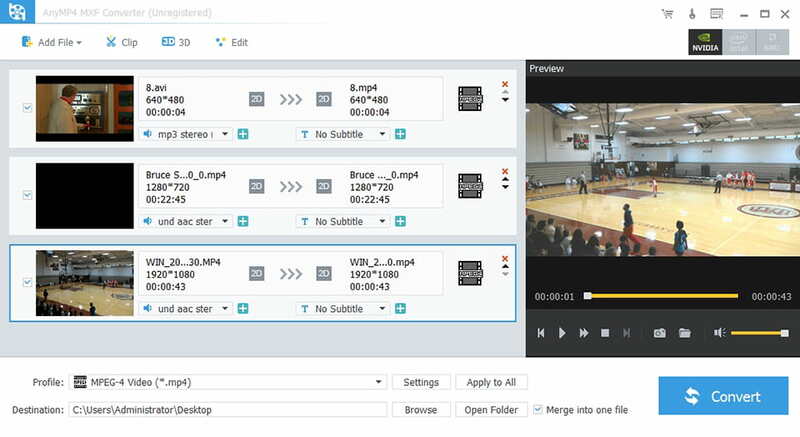 Supports watermark and subtitle adding. Aiseesoft Sansa Media Converter is the professional DVD/video to Sansa converting software, which is designed for Sansa users to rip any DVD movie and convert popular video files to Sansa compatible video and audio formats.